Have you ever had one of those moments where you have a litany of tasks that need your immediate attention, but you also have a toddler clinging to your leg and you know that if you turn your back they will immediately morph into a little ball of destruction? My 3 year old would happily entertain himself, but that always results in a gigantic mess that I then have to clean up. It’s moments like those when dinner is waiting to be cooked and homework needs checking that I have to get creative to keep the 3 year old entertained without my constant supervision. Being 3, he is full of artistic ‘flair’. Give him some paints, a coloring book and crayons, you name it, and he’s happy and pumping out masterpieces. However, I know I can’t trust him alone since his creativity has a tendency to run wild. For example, he sees newly painted white walls as fresh canvas eagerly awaiting his decoration. While he could very well be a budding artiste, a future Picasso perhaps, he and I have varying tastes on what composes harmonious home decor. It was one of these times, with my son begging to ‘paint’ and dinner bubbling away on the stove, that I grabbed a large ziplock bag and some of his tubes of finger paint, and a genius idea was born: fuss-free finger painting! He got to ‘paint’ and none of Mommy’s things got painted on. He loved it, especially since he could magically erase his doodle and begin again. Since then, we do this all the time and have used it to practice making shapes, letters, numbers, you name it. It’s saved my sanity many a time and allowed me to be productive while keeping my son safely, and cleanly, entertained. For a busy mom, fuss-free finger painting is the way to go! 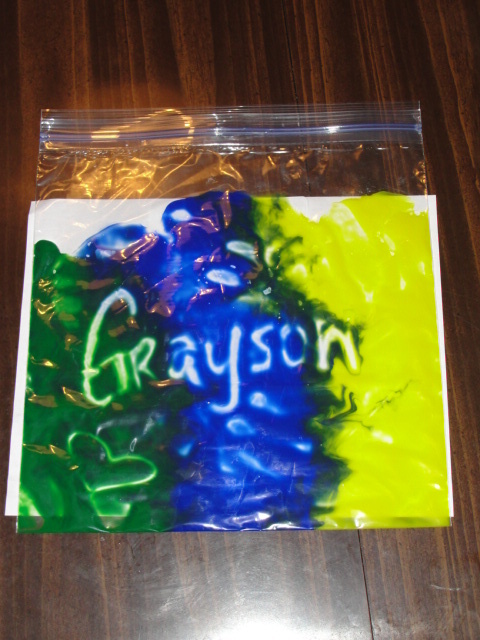 Squirt several dollops of different colored finger paints into your ziplock bag. Lay your sealed bag over top of a blank sheet of white paper onto a flat surface such as a kitchen table or desk. Tape the top and bottom of the ziplock bag to your designated work surface to secure in place. Sit your child down and let them ‘paint’. When they’re done simply detach and throw your paint-filled bag away, or save it to use again later. No mess, and no stress!